Diddy takes us for one hell of a ride in his upcoming Julien Bachelet-directed short film, Paris Is Burning. The piece documents his recent stay in France for Paris Fashion Week. 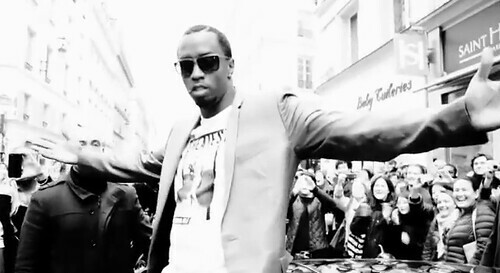 In this short trailer, Sean Combs gives us a preview of the flashy life as he causes pandemonium in the streets of Paris, rubs shoulders with designer Marc Jacobs, sits front row on the catwalk with Cassie, and taking in the town’s nightlife. It isn’t a Diddy visual without a little stunting as he goes watch shopping with a visit to Rolex. First Tupac gets resurrected then this shocker! Puffy, I can’t ride with you anymore. The votes are in and your gay. I tried to ignore the media red bull, but you went over the edge. I guess you wanna look like Ms. Monroe too or Lena Horn like the drags in the original piece “Paris on Fire”. Why would you chose that title. I don’t have anything against the choice of gay, but not you too Sean. I hate what Hollywood does to people. It makes the entire celebrity world gay for money, jewelry, and respect. “Man down”! but yeah the choice of title is suspect – his last album WAS titled “Last Train to Paris” though….